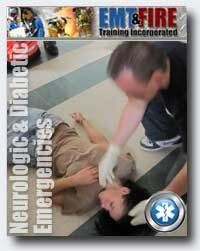 This EMT Neurologic & Diabetic Emergencies CEU Course is available in two separate formats. Students may choose the Self Paced lecture or the Virtual Instructor Led Training (VILT). The Self Paced EMT Neruologic & Diabetic Emergencies CEU lecture may be completed on the students own schedule. Students login online, watch the lectures and then take an assessment exam over the material. Once the exam is successfully completed with a score of 80% or better, the student is automatically issued a certificate of completion. Multiple exam attempts are permited. You may apply this course to the NREMT required hours of NON-live continuing education. 1. Identify the signs, symptoms and treatment of a patient who has had a stroke. 2. Describe the signs and symptoms of status epilepticus. 3. Describe the postictal state and your potential treatments . 4. Identify treatment priorities when treating a patient who has had a stroke. 5. State different causes of seizures. 6. Recognize the need for appropriate history gathering of stroke patients. 7. List signs and symptoms of a cerebral aneurysm. 8. Describe hypertension's potential role in a cerebral aneurysm. 9. Describe the right and left cerebral hemispheres and what they control. 10. Identify the patient taking diabetic medications with altered mental status and the implications of a diabetes history. 11. State the generic and trade names, medication forms, dose, administration, action, and contraindications for oral glucose. VILT = Virtual Instructor Led Training that takes place online in a virtual classroom. Students attend lectures at specific times and have LIVE access to instructors and interaction with other students. VILT is recognized and accepted as LIVE training and continuing education by the National Registry of Emergency Medical Technicians (NREMT) as well as the Continuing Education Coordinating Board for Emergency Medical Services (CECBEMS). DL = Distributive Learning activities that are self paced and may be completed online at the student's convenience. Students may stop and start lectures over any period of time until it is complete. DL activities are recognized and accepted as accredited continuing education by the National Registry of Emergency Medical Technicians (NREMT) as well as the Continuing Education Coordinating Board for Emergency Medical Services (CECBEMS).